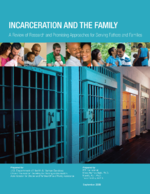 Another potential disruption in the child’s life associated with parental incarceration is a change in the child’s caregivers or the addition of a new member to the household (Johnson & Waldfogel, 2002; Nurse, 2004). For children who reside with a parent who becomes incarcerated, parental arrest can trigger placement in foster care, the introduction of new partners or family members into the household, and increased reliance on nonparent adults for care. Frequent changes in relationships appear to represent a common source of disruption in children’s lives (Furstenburg, 1995; Nurse, 2004). Citing Whelan’s (1993) finding that the presence of adults other than blood relatives in a child’s home increases the chance of victimization, Johnston (2006) suggests that the relationship between parental incarceration and various negative child outcomes may be affected by changes in family structure and an associated increase in victimization experiences among children with an incarcerated parent as well as by incarceration itself. Longitudinal data from the first three waves of the Fragile Families Study indicates that instability in the home environment, particularly changes in a mother’s romantic relationships when a child is young, can lead to increased child behavioral problems. Following a sample of 2,111 children for 3 years, Osborne and McLanahan (2007) found that each change in a mother’s romantic partnership was associated with an increase in children’s anxiety, depression, and aggression. Furthermore, the influence of mother’s relationship changes was largely mediated by maternal stress and negative parenting practices. Out-of-home placement has been suggested as another contributor to the negative effect of incarceration on children’s well-being. A study of 258 adolescents receiving mental health services found that out-of-home placement appeared to exacerbate the effect of incarceration on adolescents’ emotional and behavioral problems (Phillips, Burns, Wagner, Kramer, & Robbins, 2002). The likelihood of placement with a nonparent increases with the presence of other psychosocial risk factors in the child’s life, including low paternal or maternal educational attainment, public benefit receipt, and paternal or maternal history of abuse (Johnson & Waldfogel, 2002).